Who Was Sgt. William Jasper? Carolina Day commemorates the American military victory at Sullivan’s Island on 28 June 1776, and has been celebrated in Charleston every year since 1777. At that time, the city’s colonial-era fortifications and its able militia were in readiness for the inevitable British attack. Initially the American leaders assumed the enemy would focus its attack on White Point, the southern tip of the peninsula, because we had little hope of preventing the British from sailing past Sullivan’s Island and entering our harbor. Thanks to the heroic efforts of the men of the Second South Carolina Regiment, however, the British navy was unable to pass the unfinished palmetto log fort on Sullivan’s Island that was soon named Fort Moultrie. The two star performers of that battle on 28 June 1776 were the fort itself and an obscure sergeant named William Jasper. The partially-completed fort, built of spongy palmetto logs and sand, absorbed the British cannon shot and held firm during the long day of hot action. The sergeant won eternal fame by climbing atop the fort’s parapet wall to rescue its fallen flag and affixing it to a makeshift staff. William Jasper’s dramatic act of bravery rallied the spirits of his weary comrades and may have turned the tide of the battle. For this, his name is forever associated with South Carolina’s fight for independence. This year Carolina Day falls on a Sunday, so the various commemorative events will take place on Saturday, June 27th. If you’re headed to Fort Moultrie on Sullivan’s Island, please join me at noon for a biographical profile of Sergeant William Jasper at the island’s Edgar Allan Poe Library branch. Here’s a conundrum I’ve been struggling to decipher for several years: how can we reconcile the fact that water once flowed from the Cooper River, across East Bay Street, into Dock Street (now Queen Street), with the fact that there was supposedly a solid brick “wharf wall” along the eastern line of East Bay Street? After a lot of head scratching and research, I think I’ve found the answer. Prior to the early 1740s, South Carolina’s colonial legislature made a special exception in the law empowering the brick “wharf wall,” which allowed a “breach” in the wall to exist at the east end of Dock Street, to permit the flow of water. This authorized exception is first mentioned in a 1714 law authorizing improvements to the wharf wall, and it seems to have continued until the “water course” in Dock Street (renamed Queen Street in 1734) was finally obliterated in the the 1740s. Johnson’s Ravelin, also known as Johnson’s Cover’d Half Moon, was a man-made triangular island (of sorts) that guarded the only land entrance into Charleston for approximately thirty years. Designed in December 1703 and dismantled in the early 1730s, this important defensive work was once a major landmark of our city’s built environment. Today, however, it’s completely unfamiliar to most of the residents and tourists who pass over its remnants at the modern intersection of Broad and Meeting Streets. The history of Johnson’s Ravelin begins in December 1703, when Governor Nathaniel Johnson called an emergency session of the South Carolina General Assembly in Charleston. Credible intelligence had just been received, the governor informed the legislators, that Spanish forces were massing at Havana and St. Augustine for an invasion of South Carolina, and immediate action was required to prepare an adequate defense of the colony. After discussions and debates, the legislature voted to fund a new system of fortifications to surround the highest, driest land in the capital, Charles Town, with a new system of fortifications. Two French Huguenot refugees were summoned to design the enceinte and to lay out the walls and moats that would encircle the town for the next three decades. One of the most impressive features of the 62-acre trapezoid enceinte of Charleston was the ravelin, a detached work designed to guard the only landward entrance to the town. This feature was not a local invention, of course, but rather a standard component of European-style fortifications that was described and illustrated in every military textbook of the late seventeenth century. French engineers under Louis XIV were among the best and most prolific practitioners of fortification construction during that era, and so it is telling that the English government of early South Carolina turned to French civilian immigrants for advice in this moment of military crisis. The English borrowed the French term ravelin, but occasionally they used an English equivalent phrase “covered half-moon,” so-called because this feature allows musketeers (that’s the correct term) to “cover” or defend a semicircular sweep of land in front of the town gate. By October 1704, Governor Johnson reported to the Lords Proprietors of Carolina that the new works around Charleston were “nearly perfected.” The earliest known illustration of the enceinte of Charleston appears in map published in London in 1711, the so-called “Crisp Map.” The two images below are details from that map. 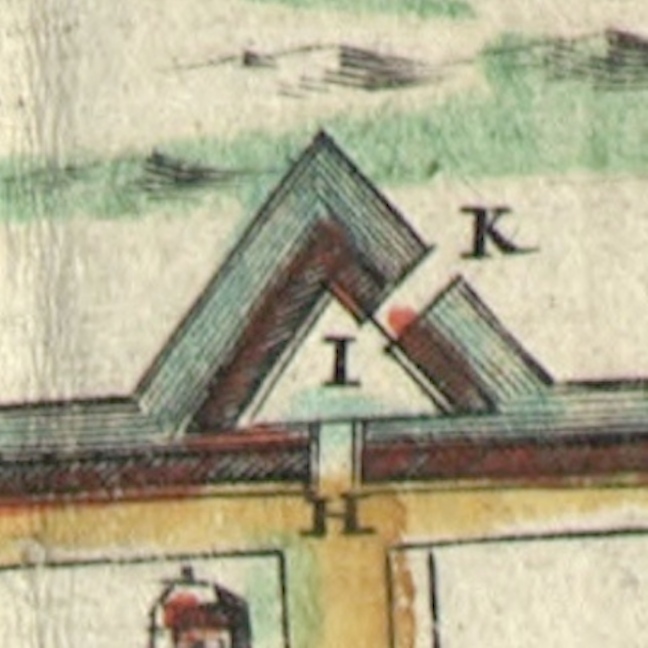 The first shows an extreme close-up of the ravelin with features labled “H,” “I,” and “K” (remember that the letters “I” and “J” were interchangeable at this time), while the second image shows the accompanying explanation of those three features. As you can see, the ravelin or “cover’d Half Moon” named for Governor Johnson included not one, but two drawbridges leading to the town gate. Persons traveling to Charleston from the country came southward down the “broad path” (King Street) to the site of the modern intersection of King and Queen Streets, then turned to the southeast and approached the ravelin. The first drawbridge “in ye Half Moon” (letter K) stretched along a northwest-southeast trajectory, perpendicular to the ravelin’s outer moat. Having crossed over that bridge onto the ravelin proper (letter I), one then turned approximately 45 degrees to face due east and then crossed over a second drawbridge “in ye Line” (letter H) and passed through (or under) the gateway into the intersection of Meeting and Broad Streets. These drawbridges, or at least the outer one, were still present and being repaired in the late 1720s, despite an often-cited but inaccurate notation found on a 1739 map of Charleston stating that the town’s early fortifications were removed in 1717. In reality, the ravelin and its associated features were dismantled in the early 1730s, though the exact date is lost among some missing legislative records of that era. It was during the early 1730s that the physical limits of the town began to expand rapidly, as a truce reigned between Britain and Spain and South Carolina—now finally a “Royal” colony—settled into a brief era of peace and prosperity. The obsolete ravelin was soon forgotten, but remnants of its moat continued to linger for many years. Shortly after the 1743 completion of the provincial armory, near the southwest corner of Broad and Meeting Streets, the keepers of the public arms complained that the building’s proximity to an adjacent “pond” was causing the weapons to rust and decay. There was no natural “pond” at this site, however; the water was simply a vestige of the old moat. 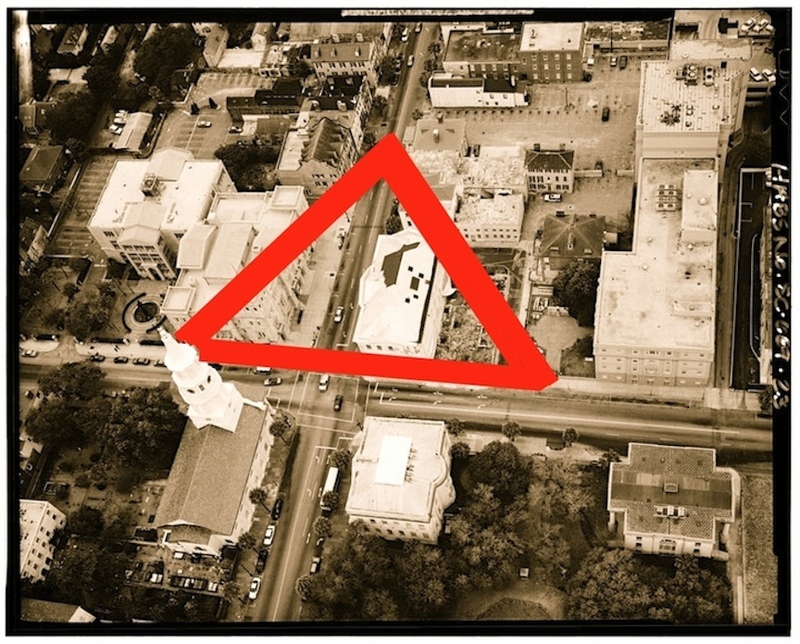 A similar problem was found a decade later at the northwest corner of Broad and Meeting Streets, where the South Carolina government planned to build its state house (now the Charleston County Historic Courthouse). The commissioners appointed to construct the state house objected to that site, noting in the spring of 1752 that “the ground is so loose and full of quick-sands, as to render it insufficient to support the weight intended to be laid upon it.” That site had once been high, dry ground, but the former moat surrounding the ravelin had compromised the integrity of the soil. In the image below, I’ve taken a 1995 HABS photograph of the intersection of Broad and Meeting Streets and drawn heavy red lines to indicate the approximate location of the moat surrounding Johnson’s Ravelin. The placement of these lines is not entirely hypothetical; rather, they are based on eighteenth-century documentary descriptions and archaeological evidence from the late 1990s. Wednesday, May 27th 2015 at 6 p.m.
2nd Floor Classroom, Charleston County Public Library, 68 Calhoun Street, 29401. The walls of early Charleston were not just designed to discourage potential invaders. They were also meant to protect the population, as a “place of refuge,” in times of alarm. During the Yamasee War of 1715–1717, the fortifications of urban Charleston served exactly this role, sheltering many hundreds of refugees fleeing the frontier violence in Granville and Colleton Counties. First-hand accounts of that era confirm that settlers fled to the colonial capital, where a strong gate at Johnson’s Ravelin was the only land entrance into the town. Please join me for a free program about the Yamasee War on May 20th, and stay tuned for more details about the upcoming program on Johnson’s Ravelin on May 27th! Effective fortifications require support structures in which to store and maintain the supplies, accessories, and tools that enable a successful defense in times of military crisis. The colonial-era government of South Carolina funded several magazines for the storage of gunpowder, for example, and that story is admirably interpreted at the venerable 1713 Powder Magazine on Cumberland Street. Our colonial lawmakers also knew, however, that it was unwise to store metallic objects like guns and bayonets, which might produce sparks when moved, in close proximity to gunpowder. So where were the publicly-owned muskets, cutlasses, and cannon of early Charleston stored? The answer is two-fold: “small arms” were stored in an armory, while cannon and carriages were stored in an arsenal. So where were those buildings in colonial Charleston? In the early years of South Carolina, the government owned a relatively small number of small arms and cannon, and the storage and maintenance of these weapons was not well regulated. Armaments were supposed to be stored in public facilities, but since such structures were few in number, the government struggled to keep track of its weapons. As the inventory of muskets, cutlasses, cannon, and mortars grew in the early eighteenth century, the situation finally came to a head. In the late 1720s, the government “fitted up” a large attic apartment with dormer windows above the Council Chamber in the Half-Moon Battery at the east end of Broad Street. Owing to the proximity of this makeshift armory to the harbor and sea breezes, however, the weapons quickly rusted and corroded. By 1735, the colony’s publicly-owned small arms were entrusted to two local gunsmiths who were paid to house and maintain them—at their private residences. With the outbreak of a fresh war with Spain in 1739, the so-called War of Jenkins’ Ear, the South Carolina legislature finally committed funds to build a proper armory for the provincial weapons. After various construction delays, not the least of which was the great fire of 18 November 1740 that crippled the town, the new armory finally opened in early 1743. 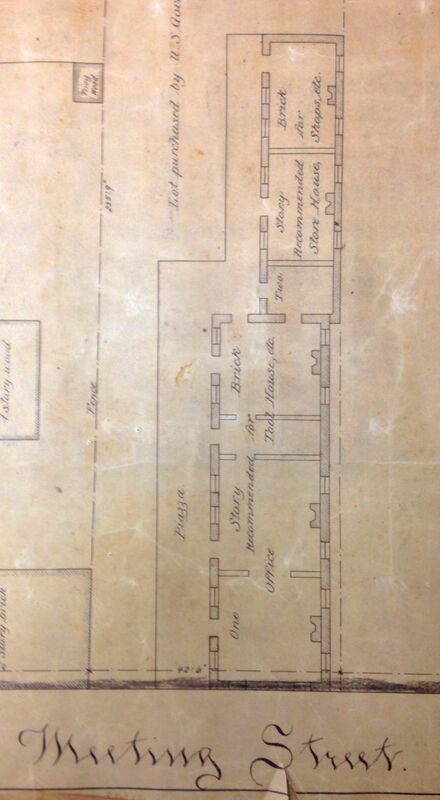 A detail from an 1889 plat showing the 1743 armory. From the collections of the Charleston Archive at CCPL. Between 1768 and 1886, the main Guard House(s) of the city’s police department stood at the southwest corner of Meeting and Broad Street, in front of the old armory/arsenal buildings, which continued to operate as an official state “laboratory” for artillery storage and maintenance. The destructive earthquake of 1886 shattered the Guard House, however, and the site was cleared for the erection of the present Federal Post Office (completed in the 1890s). A plat of the public property at this site, made in April 1889 and shown above, indicates the outline of the proposed Federal building, surrounded by ancient auxiliary buildings that were also slated for demolition. As you can see, the plat includes a long, narrow brick building facing Meeting Street that is very likely the 1743 armory/arsenal building. This historic structure was demolished and cleared in the early 1890s, and the site is now occupied by the courtyard of the Hollings Judicial Center at 83 Meeting Street. Wednesday, 22 April 2015 at 6 p.m.
Charleston County Public Library auditorium, 68 Calhoun Street, 29401. Lyttelton’s Bastion was perhaps the most sophisticated and expensive of all the fortifications built in colonial Charleston. Completed in 1757 and named for newly-arrived Royal Governor William Henry Lyttelton, this work was designed as a “middle bastion” on White Point between Granville’s Bastion and Broughton’s Battery. Its construction employed earth, wood, brick, and tabby, and included a pair of flanking moats and floodgates to harness the tidal waters. More importantly, it featured two levels of cannon platforms to maximize the firepower of its compact, geometric shape. In the end, however, these impressive elements caused William De Brahm’s ambitious fortification designs for Charleston to be both over budget and behind schedule, and De Brahm was sacked before the bastion was completed. It was then finished, and perhaps simplified, by his successor, the young engineer Emmanuel Hess. If you’ve never heard of Lyttelton’s Bastion, perhaps you’ve encountered descriptions of it under another name. During the American Revolution, some of the older fortifications at Charleston’s White Point were renamed in honor of the commanders who were stationed there in the late 1770s and early 1780s. Lyttelton’s Bastion, for example, appears in maps of that era under the name “Darrell’s” or “Dorrill’s Fort,” because Capt. Edward Darrell was commandant of the bastion and lived in or next to it. Like the rest of Charleston’s colonial fortifications, Lyttelton’s Bastion was dismantled, subdivided, and sold at auction in 1784–1785. The site was re-used in 1794 for the construction of Fort Mechanic, a smaller, simpler fortification that stood until 1818. As impressive as the design and construction of Lyttelton’s Bastion sounds, it’s still very much a mystery. 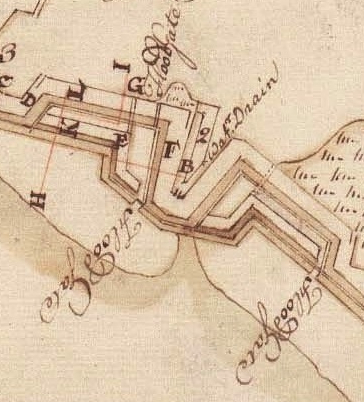 We are fortunate to have several good quality illustrations of it, drawn by British agents in the 1770s and 1780s, and we are very fortunate to have descriptions of its construction in the lone surviving manuscript Journal of the Commissioners of Fortifications. Unfortunately, however, Mr. De Brahm’s own written descriptions of the bastion’s dimensions and construction methods are rather muddled. It seems that his mastery of the English language was not as keen as his mastery of the art of military architecture. For that reason, it is difficult to reconcile the surviving illustrations of Lyttleton’s Bastion with the textual descriptions. Wednesday, February 25th at 6 p.m.
2nd Floor Classroom, Charleston County Public Library, 29401. National Archives of the U.K.